Neville Hill depot is home to unsung heroes - not just the High Speed Train fleet based at the Leeds facility, but also the staff. Many have been there since before privatisation, working hard at what is perhaps an underrated depot. When RAIL visited on a freezing December night to observe the nightshift, we were told that the depot’s movements would be reminiscent of Clapham Junction. In actuality that is a fair comparison - the number of train movements is startling. Neville Hill depot is largely operated by East Midlands Trains, with another area of the site managed by Northern Rail. 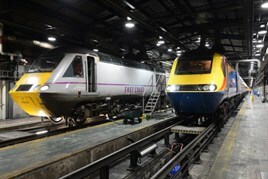 East Coast and CrossCountry trains are also maintained at the depot - the EC fleet contains High Speed Trains and Class 91/Mk 4 sets, while XC’s fleet is only HSTs. EMT’s Neville Hill configuration also comprises just HSTs (the operator’s Class 222 Meridians are based at Derby Litchurch Lane). EMT Depot Manager/Fleet Manager Linda Wain is in charge at Neville Hill. A cheerful, determined woman, she welcomes RAIL into her office for a chat before the start of the shift. She’s not working tonight, having worked through the day. My guide will be Technical Manager Simon Roberts. All the new arrivals are new to the rail industry, she says. One was delayed in starting his new job because in his previous role, in the rally industry, he had to take part in the Dakar Rally. Wain is concerned about the future. “Engineering in the UK is in a very poor place,” she says. “We said we’d work with South West Trains Graduate Engineering Intake Programme, and they had no engineering apprentices. Currently the EMT depot has 199 staff, of which 82 are fitters. The average age of staff is in the 50s. Currently the staff are split between different units. If they can prove basic engineering, prove basic skills and can follow the rules book, then they are part of Unit 1. Unit 2 demonstrates the ability to fault-find, to be able to ‘think outside the box’ regarding repairs, and to check and do the next stage of fault-finding. This enables staff to be able to use more detail knowingly. Unit 3 competencies include the ability to be able to carry out modifications. Wain says that these have just been signed off, which means staff will no longer be able to say “I haven’t been assessed” when asked to do tasks. She admits that this process has not yet started and has taken a while to sort, although team members have bought into it. It will be implemented this year. Another area that will be improved is the dwell times, with Wain implementing ‘touch time’. She doesn’t want teams standing around. Instead she wants the necessary parts to be ready, with the work carried out in a logical progression. Roberts has headed this project, and while Wain accepts that it will not be introduced overnight, it will (in time) be in everyday use. The approach is similar to LEAN/KAIZAN methods used at other depots, whereby a component for a particular vehicle is located in the area of the depot where that vehicle is maintained or stabled. Says Wain: “To me, it is not necessarily that we have trains and diagrams. It is not speeding up the throughput, which we could do. It is maximising the time the staff get with the vehicles. She gives an example where EMT has changed the guards van door locks on the Class 43 power cars. “That sounds easy, but you have to change the side of the door. And no train is the same. I want to give them more time. “Porterbrook won’t do PRM-TSI work on them . This means that they will be out of use on December 31 2019. They won’t be getting the £250,000 door modifications needed. However, the layout is “fairly poor”, she explains, before adding: “It has been made to work like this.” Trains are constantly moving around, but they all (including the Northern diesel multiple units) have to move through one set of points, which can cause congestion. There are four reception roads, as well as fuelling roads that have undergone improvement work. Previously at Neville Hill fuelling could only be done on one road, but that has changed and the depot is now more flexible. A depot change process has also just begun regarding Intercity Express Programme (IEP) trains, which will be stabled at Neville Hill when the Hitachi-built trains are used by Stagecoach’s East Coast franchise. This work includes Network Rail putting a fuelling apron on a reception road because the IEPs have their engines in different places on the train. Wain says there is no specific plan for the IEPs, because Neville Hill will not be a Hitachi depot. Cleaning of the trains will be carried out at the depot, and there will be access to the trains, but the main depot will be nearby at Doncaster. Technicians and engineers can be sent from there to carry out work on the new trains. “I foresee servicing, and perhaps that’s it,” she says. “Hitachi has said that we can fuel and clean them.” She is happy with that arrangement, as it “keeps work on the site”. Wain adds that Quality Inspectors have now been put on the fuel roads. Their jobs include fuelling and tanking the trains, as well as walking through them to check for damage inside. Once they have been inside the train, they can then concentrate on preparing it. Introducing this process has improved the speed of the trains arriving and improved the throughput. EMT and Northern Rail share the Controlled Emission Toilet plant, which creates a bottleneck. This is a key factor for the depot, says Wain. “If you thought about splitting up the depot between two operators it could not be more complicated,” she laughs. Wain has been with EMT since the franchise began in November 2007. Another major piece of work (ongoing since June 2013) is fitting Brush cooler groups. This involves removing the component before it undergoes a big rebuild and subsequent re-fitting. “This is a big piece of work,” she says. She says that while the depot looks after HSTs used by both East Coast and CrossCountry, they differ in that XC’s ‘43s’ are fitted with MTU engines (as opposed to the VP185 engines fitted to the EMT fleet). Neville Hill can work on them, but an MTU fitter does visit the depot. There is also an agreement whereby power cars can be hired by EC. Says Wain: “We swap them over. It is not in anybody’s interest to delay passengers. Having earlier mentioned that the 40-year HSTs need a lot of TLC, could this create any problems? She grins: “The irony has not escaped me. The test includes the hand back. I am wary of what could happen. It worries me that Network Rail is on about cyber security. It is way up there on the list. Wain speaks about capacity from experience. Before moving to Neville Hill, she was in charge of Nottingham Eastcroft, where EMT’s 15x Sprinter fleet is based. When Wain managed that 15x fleet it underwent refurbishment, with the Class 153s and 156s visiting Neville Hill for work. Is this something that could happen again? Delta Rail at Derby refurbished the Class 158s, but the fleet requires work in 2016, including the installation of toilets and various other components to make them PRM-TSI compatible. This is an interesting point, and Wain elaborates: “Overhaul or refurbishment is about taking bits out and putting them back in. It is a lot of work. Performance modifications can be done. The skill base then changes, and it is simple compared to the day job. Roberts explains that fitting WiFi to the trains, be it the 15x fleet or an HST, is an example of this. The main line HSTs and ‘222’ fleets have WiFi, but the 15x fleet does not. She tells RAIL that ride monitoring equipment is being fitted to trains, to monitor the data received and to carry out comparisons. A simple box is fitted to the trains - it requires GPS, so that means an aerial must be fitted to the vehicle roof. The box itself is fitted in an enclosure behind a seat inside the train. The work is being carried out on the HST fleet, with four Trailer Guards Standard (TGS) vehicles being fitted. The modification requires new wires, power and a new circuit breaker. It takes two days to fit the TGS. There is no set fitting pattern, with the equipment fitted randomly to four vehicles. The first was done at the start of December. Wain says EMT supports the work because it will also help its HSTs. New modified dampers have been fitted, and there is a belief that ride quality has been reduced. While this equipment has been fitted to enable NR to monitor the state of the track on the Midland Main Line, in effect it will also check that the modified dampers are performing correctly. “The track will not have changed much in two weeks, and the TGS is the same,” says Wain. The belief is that the ride quality will therefore be improved, with NR happy to share the data. Each TGS takes two days to modify. Wain says that because the depot is “blessed” with the skills it has, this was simple to do, with a clear benefit for all parties. As for Neville Hill depot itself, she believes that it clearly has a future, but is unsure in what capacity. “Who knows what will happen?” she says. Go back ten years, and there were discussions that the main line would be put through the existing sidings. That could not possibly happen now because of the need for capacity. “Looking at the electrification out here, looking at the main line spacing, the ability to put OLE stanchions down is tricky. We may notice if they start digging,” she laughs. “If you look at the rail industry as a whole, why not electrify the depot? It is moving to electrification, new stock and a different way of working. As this happens, the change is phenomenal. “I have been told some plans, but I have not told the staff. That is because you are told of plans and then they change. I don’t deliberately hold back, it is because I don’t know. In the meantime, Neville Hill will carry on regardless.